Natural raspberry flavor is a high strength sweet and refreshing flavoring with ripe taste. 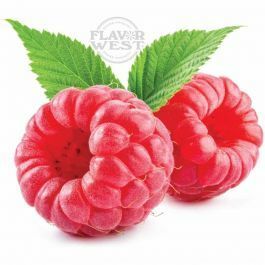 This all natural raspberry flavor add an enticingly aromatic and delicious taste in your favorite sweet or savory treats. It is good for drinks, pastries, gelato, ice cream, yogurt, confectionary and more! No artificial sweeteners. Type: Raspberry All Natural Water Soluble Flavoring. Ingredients: Natural Flavoring, Propylene Glycol. USP Kosher Grade Flavoring. Usage Rate: 15-20% for E-use. Flavor suitability: Suitable for drinks, pastries, gelato, ice cream, yogurt, confectionary and more. Specific Gravity: 1.20 No Refunds on Flavoring. Absolutely FANTASTIC flavor, but burns/gumms up coils very quickly. While I absolutely LOVE this flavor in just about everything, it burns the crap out of both my coils and my dripper builds within 3 days. I deal with it though, because of how absolutely FANTASTIC it tastes. Unfortunately, I have to order the non-natural flavoring for my customers, because they don't want to deal with that. I have found that if I only use 5-7% flavoring, it takes longer to burn my coils, but the flavor suffers. I will try mixing this with the non-natural flavoring starting at 50/50 to see how the flavor and vaping turn out. Here's hoping it works, because I can't say enough how much I LOVE LOVE LOVE this flavor and want to share it with my customers! !